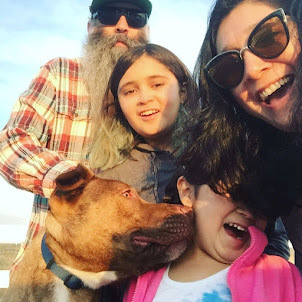 Punk Rock Parents: "Santa" Needs Some Help! So this year "Santa" and "Mrs. Claus" are having a bit of a debate about what The Phi should receive for Christmas this year. They have agreed that a hand-held game system is the gift, the debate is over which one. "Mrs. Claus" thinks that a Leapster 2 is the hand-held game system for The Phi. Great big buttons for a 4 year old and lots of games with some of The Phi's favorite characters at the Pre-K and K level for her to play. "Santa" thinks that The Phi should get a Nintendo DS lite. A more advanced game system with more realistic graphics and tons of games. Here is my, I mean "Mrs. Claus" thought process. I think the DS is a bit too advanced for The Phi. I am already imagining spending way too much time trying to show The Phi how to play a game with it ending with us both frustrated. 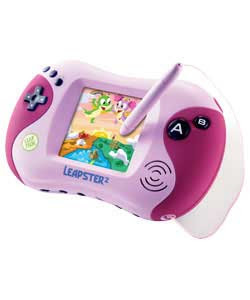 The Leapster games are geared for kids her age and they are educational. I figure we can get about 3 years out of this for her. Then it can get put away and brought back out with "Sweet Babboo" is about 4. Also in about 5 years The Phi will really want a Nintendo hand-held and in 5 years there is going to be a better, faster and smaller version that she will want and we will either have to buy her a new one or she will be the geek with the 5 year old Nintendo DS. "Santa" being "Santa" just wants The Phi to have the latest and the best. So help "Santa" and "Mrs. Claus" out! Which do you think is the right choice for The Phi? Rick wants to get Elias a DS this year, but I'm not sure he's ready for it either! Though I like that it comes in pink--not that I would get Elias a pink one. . .I just realized that my comment was not very helpful. Haha Jessica. But I agree with mrs. Claus. 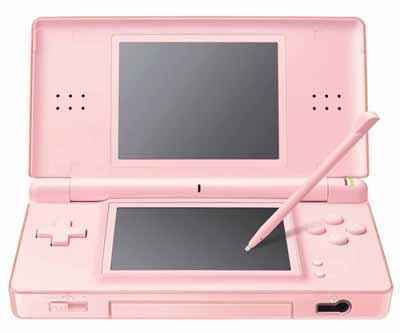 We got a DS for Siobhan when she was 5. Diego was 3. They still use it ALL the time. There are lots of kids games (Dora, Diego, etc) and it only took a short time for them to figure out the controls plus the styles is great for them. Oh, they are 7 and 5 now. Um, mommy likes it too if that matters. You can find a lot of used games too. hurry up and figure which one santa and mrs. claus is getting The Phi for christmas. That way i know what games i should get her. The DS Lite is something that she can "grow" into, so you'll get longer use out of it. Plus, it'll be fun for Mr & Mrs Clause too.